Decoration 55 framed miniatures in colours and gold, at the end of each passage of text describing the animal, some with instructions to an illuminator in French (ff. 24, 26v?, 27, 29, 29v, 33, 34v, 35-36v, 37v-39, 42v-45, 47v, 49, 50). Space left for miniatures (ff. 52-107), some with instructions to an illuminator (ff. 52v, 53v, 54v, 56, 57). 1 foliate initial with zoomorphic decoration in colours and gold, at the beginning of the bestiary (f. 3). Initials in gold on blue and rose grounds with penwork decoration in white, some with red or blue pen-flourishing, at the beginning of chapters. Initials in gold with red or blue pen-flourishing. Binding Post-1600. Royal library binding of brown leather, 18th century. Provenance The cathedral priory of St. Andrew, Rochester: inscribed, 'Liber de claustro Roffens[i] R. precentoris', 14th century (f. 3). Brother John of Malling, returned by him, probably to be identified with John Malling excommunicated as apostate and thief in 1387 (see Warner and Gilson, 1921): inscribed, 'Iste liber rep[ar]atu[m] fuit p[er] fratre[m] Joh[an]em Malli[n]gg', 14th century (f.150). Added leaves from a service book containing lessons and prayers for Trinity Sunday and preceding days, 14th century (ff. 1-2). William Grybbons and Thomas Aston: inscribed with their names by the same hand, 15th century (f.151v). Added verses in English beginning, 'He that wyll all parell flee / He must with wysdome armyd be...', 15th century (f. 152). The Old Royal Library (the English Royal Library): Westminster inventory number 'no. 519' (f. 3), included in the inventory of books in the Upper Library at Westminster of 1542; perhaps in the 1698 catalogue of the library of St James’s Palace (see [Edward Bernard], Catalogi librorum manuscriptorum Angliae et Hiberniae (Oxford: Sheldonian, '1697', but 1698? ), no. 8539. The series of illustrations are of the Second Family, according to James's 1928 classification. Bifolium signatures; guide letters for initials. Select bibliography G. C. Druce, 'The Symbolism of the Crocodile in the Middle Ages', Archaeological Journal, 64 (1909), 311-38 (pp. 315, 316, 317, 320). G. C. Druce, 'The Amphisbaena and its Connexions in Ecclesiastical Art and Architecture', Archaeological Journal, 67 (1910), 285-317 (p. 290). G. C. Druce, 'Notes on the History of the Heraldic Jall or Yale', Archaeological Journal, 68 (1911), 173-99 (pp. 177, 191, 192, pl. IX). G. C. Druce, 'The Caladrius and its Legend', Archaeological Journal, 69 (1912), 381-416 (pp. 384, 385, 390). G. C. Druce, 'The Elephant in Medieval Art and Legend, Archaeological Journal, 74 (1919), 1-73 (pp. 10, 42, pls. II, III, VII). G. C. Druce, 'Legend of the Serra or Saw Fish', in Proceedings of the Society of Antiquaries of London, 2nd Ser., 31 (1919), 20-35 (p. 21, n. 1). G. C. Druce, 'The Medieval Bestiaries and Their Influence on Ecclesiastical Decorative Art', Journal of the British Archaeological Association, 25 (1919), 41-82 (pp. 51, 64, pl. X). G. C. Druce, 'The Medieval Bestiaries and Their Influence on Ecclesiastical Decorative Art', Journal of the British Archaeological Association, 26 (1920), 35-79 (pp. 45, 52, 60, 62, 73, pls. VI, IX). George F. Warner and Julius P. Gilson, Catalogue of Western Manuscripts in the Old Royal and King’s Collections, 4 vols (London: British Museum, 1921), II, pp. 64-65. Eric G. Millar, English Illuminated Manuscripts from the Xth to the XIIIth century (Paris: G. Van Oest, 1926), p. 119. Elfrida O. Saunders, English Illumination, 2 vols (Paris: Pegasus Press, 1928, repr. New York, 1969), I, p. 48, pl. 53. M. R. James, The Bestiary: Being a Reproduction in full of the Manuscript Ii.4.26 in the University Library, Cambridge (Oxford: Roxburghe Club, 1928), p. 16. D. J. A. Ross, 'A Lost Painting in Henry III's Palace at Westminster', Journal of the Warburg and Courtauld Institutes, 16 (1953), 160 (p. 160, pl. 22a). Hugo Buchthal and Francis Wormald, Miniature Painting in the Latin Kingdom of Jerusalem (Oxford: Clarendon Press, 1957), p. 76 n. 6. Hubert Silvestre, 'Enfin un manuscrit anglais du De vita et moribus philosophorum de Walter Burley? ', Scriptorium: Revue internationale des études relative aux manuscrits, 13 (1959), 255-59 (p. 256, n. 5). F. McCulloch, Medieval Latin and French Bestiaries, University of North Carolina Studies in the Romance Languages and Literatures, 33 (Chapel Hill: University of North Carolina Press, 1962), pp. 37, 74, n. 15, 188, 189. Medieval Libraries of Great Britain: A List of Surviving Books, ed. by N. R. Ker, 2nd edn, Royal Historical Society Guides and Handbooks, 3 (London: Royal Historical Society, 1964), pp. 163, 299. Harvey Stahl, 'Le bestiaire de Douai', Revue de l’art, 8 (1970), 6-16 (p. 7, n. 6). Francis Klingender, Animals in Art and Thought to the End of the Middle Ages, ed. by Evelyn Antal and John Harthan (London: Routledge & Kegan Paul, 1971), pp. 392, 396, pls 222, 229b, 230, 231. Jaroslav Folda, Crusader Manuscript Illumination at Saint-Jean d'Acre, 1275-1291 (Princeton: Princeton University Press, 1976), p. 145 n. 126. J. W. Einhorn, Spiritualis Unicornis: Das Einhorn als Bedeutungsträger in Literatur und Kunst des Mittelalters (Munich: Wilhelm Fink Verlag, 1976), pp. 79, 278, 337, fig. 82. Xenia Muratova, 'Adam donne leurs noms aux animaux', Studi Medievali, 18 (1977), 327-94 (p. 378, pl. XI). P. L. Armitage and J. A. Goodall, 'Medieval Horned and Polled Sheep: The Archaeological and Iconographic Evidence', Antiquaries Journal, 57 (1977), 73-89 (pp. 76, 77). The Benedictines in Britain (London: British Library, 1980), no. 99 [exhibition catalogue]. F. N. M. Diekstra, 'The Physiologus, the Bestiaries and Medieval Animal Lore', Neophilologus: An International Journal of Modern and Medieval Language and Literature, 69 (1985) 142-55 (p. 155, ils. 1, 8). Nigel Morgan, Early Gothic Manuscripts, 2 vols, A Survey of Manuscripts Illuminated in the British Isles, 4 (London Harvey Miller, 1982-1988), I: 1190-1250, no. 64. Mary Richards, Texts and Their Traditions in the Medieval Library of Rochester Cathedral Priory, Transactions of the American Philosophical Society, 78, part 3 (Philadelphia: The American Philosophical Society, 1988), p. 122. Two East Anglian Picture Books : A Facsimile of the Helmingham Herbal and Bestiary and Bodleian Ms. Ashmole 1504, ed. by Nicholas Barker (London: The Roxburghe Club, 1988), p. 6. 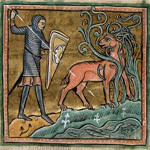 Anne Payne, Medieval Beasts (London: British Library, 1990), p.14. Claire Donovan, The de Brailes Hours: Shaping the Book of Hours in Thirteenth-Century Oxford (London, British Library, 1991), p. 202 no. 11. Dora Faraci, 'Navigatio Sancti Brendani and its Relationship with Physiologus', Romanobarbarica, 11 (1991), 149-73 (p. 159, n. 24). Debra Hassig, Medieval Bestiaries: Text, Image, Ideology (Cambridge: Cambridge University Press, 1995), p. 186. Ron Baxter, Bestiaries and their Users in the Middle Ages (Stroud: Sutton, 1998), pp.147, 150, 152, 170, 174, 175-76, 192. Xenia Muratova, 'Le bestiare medieval et la culture normande', in Manuscrits et enluminures dans le monde normand (Xe-XVe siècles), ed. by Pierre Bouet and Monique Dosdat (Caen: Presses Universitaires, 1999), pp. 151-68 (p. 154). The Libraries of King Henry VIII, ed. by J. P. Carley, Corpus of British Medieval Library Catalogues, 7 (London: The British Library, 2000), H2.767. Christopher de Hamel, The British Library Guide to Manuscript Illumination: History and Techniques (London: British Library, 2001), pl. 72. Alixe Bovey, Monsters and Grotesques in Medieval Manuscripts (London: British Library, 2002), pp. 23-24, pl. 19. Elizabeth Morrison, Beasts: Factual & Fantastic (Los Angeles: J. Paul Getty Museum, 2007), p. 21. Scot McKendrick, John Lowden, and Kathleen Doyle, Royal Manuscripts: The Genius of Illumination (London: British Library, 2011), no. 81 [exhibition catalogue].